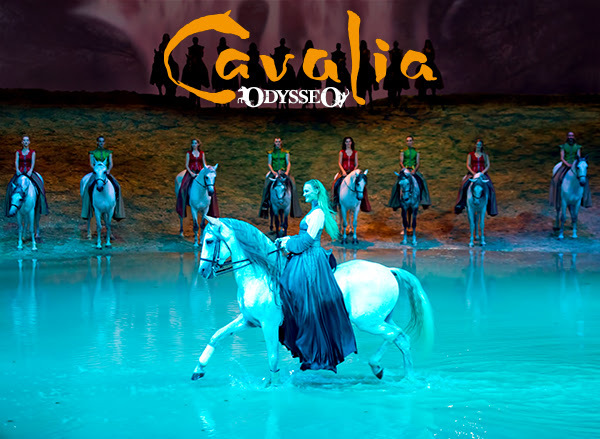 Cavalia’s Odysseo has galloped into Utah and the hearts of audience members with its creative showcase of aerials, freely running horses, acrobatics, and song. Housed in a White Big Top tent, Odysseo is the world’s largest touring production. It features 65 horses, 48 riders, and many incredible aerialists and acrobats. The show wowed me beyond expectation, outdoing the Cirque du Soleil’s I’ve seen in Vegas. I also ride horses avidly, and seeing the performers gently lead and guide the horses on a massive stage with a mountain, and even water was completely unexpected and incredible. That said, tickets to Odyseeo Utah can be a bit pricey. While it’s so worth the price, those on a budget may not be able to afford prime seats. So here are three ways to save on tickets to Odysseo UT before it trots to another city on May 16. Save 10% on evening shows with code LOVESLC. Buy a family package and get 30-45% off adult tickets. Pay for two adults, two children and get 30% off. Pay for two adults, three or four children and get 40% off adult ticket. Or pay for two adults, five or more children and get 45% off adult ticket. Go with a crowd, get a discount. Groups of 12 or more are eligible for discounted tickets.